Most of us have heard the derision against the ARVN (Army Republic of Viet Nam), “Want to buy some ARVN rifles? Never been fired and only dropped once!” That it is a rehash from earlier times makes it no less stinging in its denunciation of the South Vietnamese Forces that fought in South Viet Nam many years ago. It’s also very untrue. The South Vietnamese soldiers, sailors and airmen fought for their country as hard as any other soldier ever has. While America lost over 58,000 of our sons in Viet Nam, South Viet Nam lost about 266,000 of theirs. In all, the South Vietnamese Forces were effective fighters, even though they were often under trained and under armed while facing a hostile communist force well trained and well armed by the Communist Chinese and the former Soviet Union. Knowing this, I am left perplexed reading the Olympian’s headline, Plan to honor Vietnamese soldiers on memorial in Olympia angers U.S. vets. 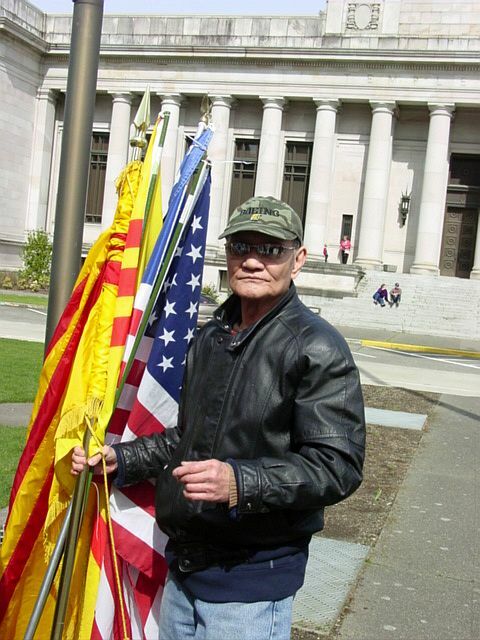 It seems that a small band of U.S. Veterans groups, Vietnamese Veterans and community members has been working with the State Department of Veterans Affairs to add an inscription alongside the Vietnam Veterans Memorial in Olympia to honor both Republic of Vietnam and American soldiers who fought in Viet Nam. 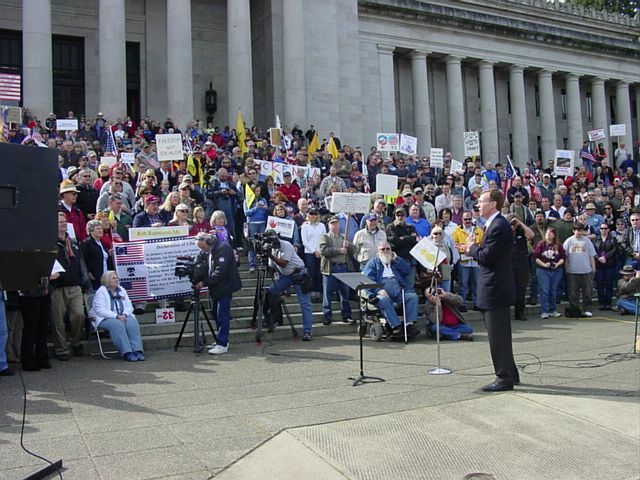 Rob McKenna, Washington State Attorney General, was well supported Saturday, March 27, 2010 on the Washington State Capitol steps as more than 2,000 citizens rallied to express support for his joining in with 13 other states in filing a lawsuit against Barack Obama’s takeover of our Medical Insurance Industry. KOMO News Seattle described it as Rock star reception for health plan rebel McKenna while the Olympian headlined it as “I represent you,” McKenna tells large crowd of supporters on Capitol steps and trying to write off attendance as a mere 850. 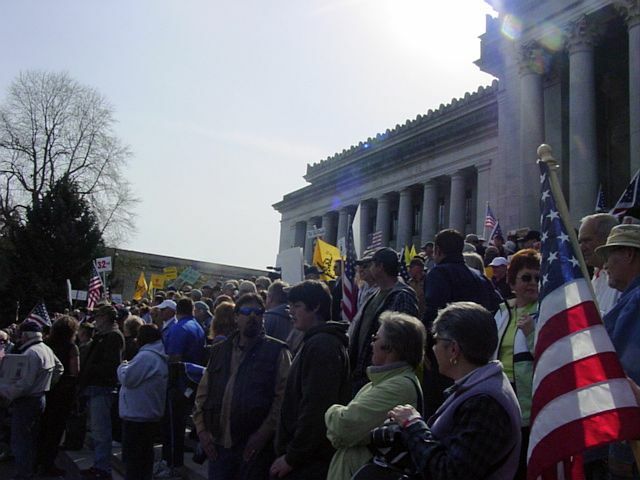 Sorry, Olympian, but Washington State Police told us it takes 2,000 people to fill Capitol steps and not only were those steps filled, the crowd spilled over to half fill the street between the Capitol Building and the Temple of Justice. The Capitol steps erupted in loud applause and vocal approval. 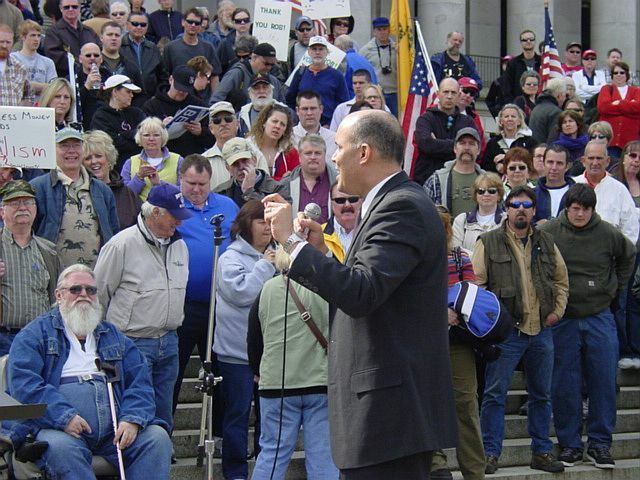 At one point, he acknowledged that most gatherings at the Capitol Building usually result in the people assembled standing below the speaker at the top of the steps and how it is more fitting that he stand below at ground level as the citizens filled the steps of “their Capitol” with their backs towards the Legislature, which has been steadily piling more taxes and fees upon Washington taxpayers. Republican state Senators. Mike Carrell and Val Stevens and Republican state Representative Tom Campbell followed with speeches of their own, supporting McKenna and informing those present of Legislative steps being taken to oppose forcing Washington Citizens being forced to comply with the Healthcare Insurance reform against their will. Clark County resident Tom Niewulis inspired the crowd as he made an appearance in the guise of Samuel Adams. 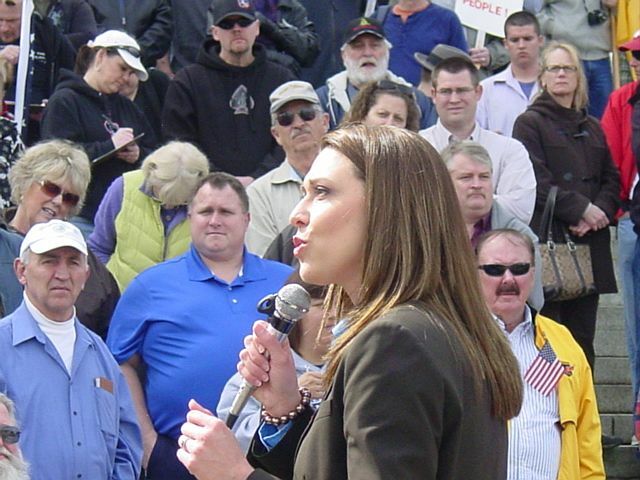 A few candidates also made appearances and spoke after talk-radio hosts Kirby Wilbur and David Boze. David Castillo and Jaime Herrera, both seeking to win the 3rd Congressional District seat being vacated by Democrat Brian Baird spoke, as did David Hedrick, seeking the same seat. Art Coday, hoping to unseat Democrat Murray also gave a short presentation. I am sure other candidates spoke as well, but I missed their speeches as I fell back to speak with McKenna and others who had gathered. McKenna seemed appreciative when I told him that I have not always supported him and probably opposed many of his stances in the past. But, he has my total unwavering support in this. 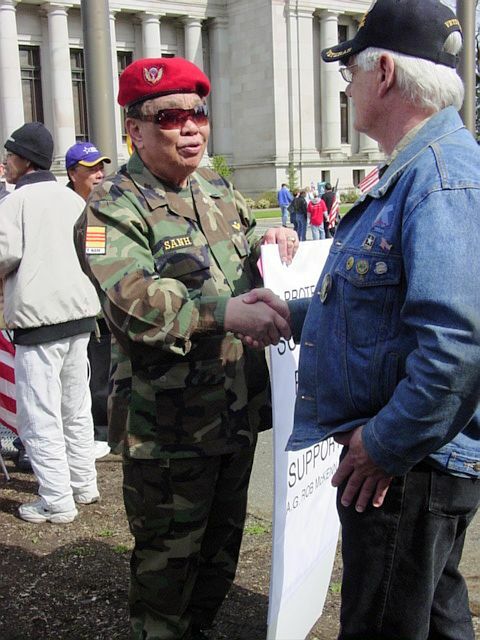 Milling about as the crowd began dispersing, I was particularly pleased to meet and speak with Col. Pham Huy Sanh Sr. (Ret), Executive Board Chairman of the Republic Of South Viet Nam Armed Forces Veterans Confederation of Washington State. That South Vietnamese showed up in support of McKenna’s stand speaks for itself, they not wanting to see their adopted country fall to communism as did theirs when our Democrat led Legislature completely abandoned the struggling ally in April 1975. In all, the rally went well without incident. No anarchists or other liberal/oppressive appeared to make trouble. Speaking with State Troopers afterwards, they acknowledged we conservatives cause them no worries when we gather and are well behaved. To Governor Christine Gregoire, I hope you heard us from the Governor’s Mansion. 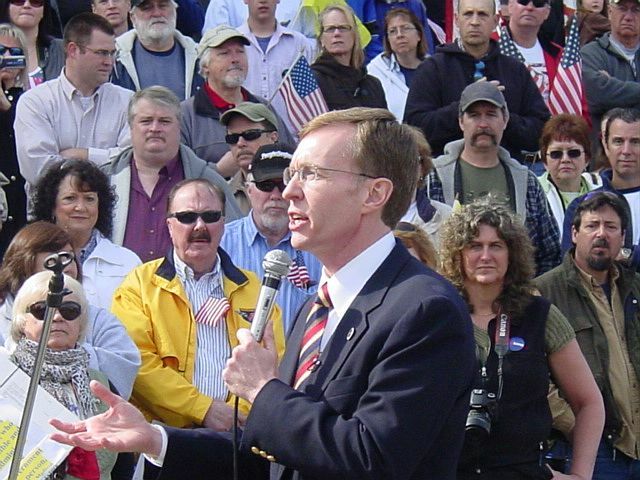 The support showed Rob McKenna on this issue greatly minimized the 50 or so of your followers who protested outside of the Attorney General’s office Friday. What Are Democrats In Olympia Up To Now? Strange happenings in Olympia, Washington today. The Independent Policy Analysts, Washington Policy Center informs us of Senate Bill 6853, introduced today that says virtually nothing! 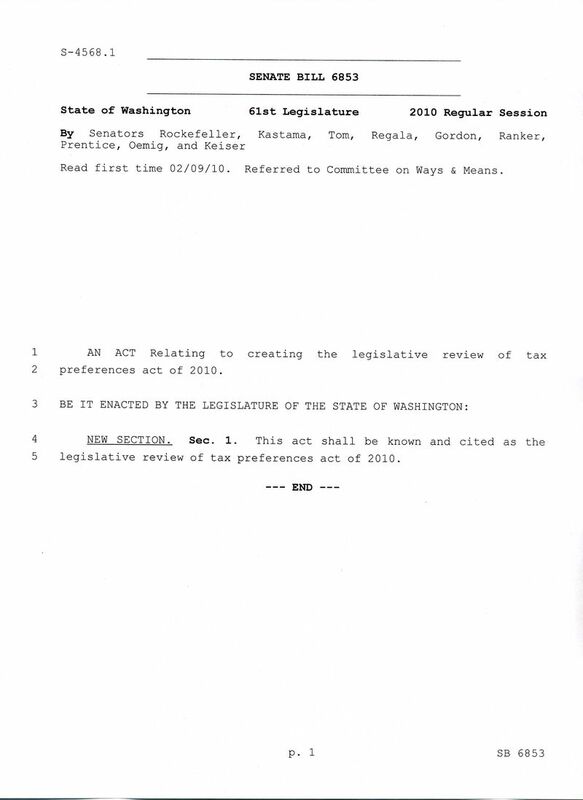 There is no actual text in the bill, but it has been sent to the Ways & Means Committee, who may decide to approve it and send on to the full Senate. No independent review can be made nor can Washington State voters decide whether or not they prefer this. Are Olympia’s Democrats preparing to shove something down our throats, like it or not?